Used my unfed starter for this nice loaf. 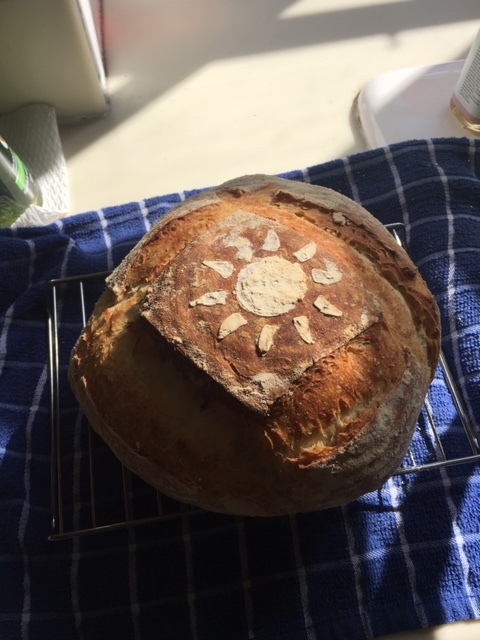 Not exactly sourdough but has a nice tanginess to it. Got tired of throwing starter away after feeding. What do you mean by not exactly sourdough? Did you use yeast too? Kinda on the same subject: If your starter is dormant in the fridge for a few days but you use enough of it…more than usual…you’ll likely have enough yeast and bacteria to leaven the dough. This is evidenced by the sourdoughs a few of us have played with here that have only about 5g active starter. Or the savory babka recipe on the Breadtopia blog that uses 200g starter, unfed is fine. I’m noting all this because I don’t like to toss starter either. The same dough as the babka also makes bubbly naan flatbread. Yes, I used some active yeast as well as the unfed starter. That’s why I said not exactly sourdough! Thanks for the "unfed"suggestions. I’ve made biscuits, pancakes and today’s loaf with unfed starter. That’s a beautiful loaf! Love the stencil! I never throw starter away even though I bake less than once a week because I maintain a very small quantity of it in the refrigerator - usually 2-3 Tablespoons worth. When It’s time to bake, I feed the starter the same day or the day before. A lot of sources say that a feeding should add water and flour in weight equal to the existing starter which triples the amount. It may not be conventional, but I usually only add 25 or even fewer grams of each which seems to get my starter vibrant again. Some of the loaves I bake use only 10g of starter, so when my supply gets beyond 1/3 cup or so, I’ll just use more starter in the next loaf and adjust the proofing times accordingly. I’ve also found that my starter is remarkably forgiving. It can go unfed for weeks in the refrigerator and be back to more or less full strength with just a good feeding. Works for me. Thanks Wendy! I’m still relatively new to the “sourdough game” so a lot of what I do is still kind of hit or miss. I keep way more starter than I probably need but I haven’t refined my game yet. Having fun though! I actually keep quite a large amount of starter in my refrigerator. There’s a part of me that would panic if I thought I wasn’t going to have enough of him, named Cyril, to bake with and then have enough to feed so I can grow some more. I probably have about 400 grams of Cyril in his jar weekly. Besides, if I find I just have way too much Cyril I make delicious sourdough pancakes, while continuing to maintain a “healthy” amount of him to bake with. I know…I’m officially a “sourdough hoarder,” LOL! Nice! I keep two quart jars of starter so as never to not have enough. I have one named “Flour of Power” and the other is “Flour Child” that was spawned from the Power jar! I keep a third pint jar with unfed starter that I use for pancakes, biscuits etc. Hoarders unite! SWEET! It appears there are at least two of us who tend to “hoard” starter, LOL! I have a funny feeling there may be a few more of us out there, even if they are reluctant to admit it, LOL! You hoarders are cracking me up!! If it works for you, go for it. If you ever decide to try keeping less, know that it’s possible to build up a large quantity of starter from a very small amount in a day. I know of people that build just the amount of starter that they need for their next bake from the dregs left in the jar from the last bake. That’s cutting it a little close even for me. But it just shows how flexible bread baking is. While I don’t hoard starter, I must confess that an embarrassing amount of space in my refrigerator and freezer is taken up with jars and bags of assorted grains! It’s a disease without a cure! Oh @wendyk320, I SO hear ya! Not only is there a large 1.5qt jar of Cyril in my fridge, there are bags of 2 different bread flours and the flour I feed Cyril with taking up most of an entire shelf in my fridge. NOT to mention, the several bags of different whole wheat berries and rye berries taking up lots of space in my freezer, LOL! Gotta bake bread, right?